>> If truth be told, a local sculpture carved into a 100 year old Elm tree on Montpellier Hill in Harrogate, North Yorkshire, helped inspired chapters 4 and 5 in story book: Alice Returns Through The Looking-Glass, by author Zizzi Bonah. 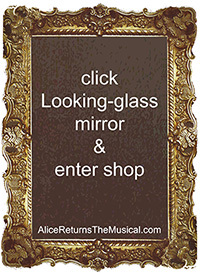 Have you strolled upon an “Alice-like” setting in your local town? Wordplay: Ghoughphtheightteau – what does this curious looking word spell?